When the Norwegian Parliament’s Standing Committee on Energy and the Environment visited Smart Innovation Norway headquarters in Halden on Monday, they were introduced to the company’s unique EU research expertise in general and to the Horizon 2020 project INVADE in particular. “Digitalization is part of the reason why we wanted to come here for a visit. Smart Innovation Norway has developed an environment capable of large-scale modelling, but also in a small scale. Even the daily life in Halden,” says Kjetil Kjenseth, Head of the Norwegian Parliament’s Standing Committee on Energy and the Environment. Alongside the rest of the committee’s seventeen members, he dedicated an entire day to the city of Halden’s key businesses. The tour was concluded in Smart Innovation Norway’s Simulation Centre, where the committee was eager to learn about the research company’s many EU projects, especially the H2020 INVADE project. “INVADE is the largest Norwegian-led energy research project in EU’s Horizon 2020 program and has a special attention. INVADE aims to demonstrate how stationary batteries and ‘batteries on wheels’ can be used to optimize energy and power related operations for the benefit of grid owners, private households and buildings, as well as the market. At the core is a cloud-based flexibility management system integrated with electric vehicles and batteries,” explains Dieter Hirdes, Head of Research & Innovation at Smart Innovation Norway. During the two-hour visit, Hirdes gave an introduction of the company’s energy research and the EU project, INVADE. In this project, a considerable amount of attention is directed towards commercialization of the research results and two examples were presented. 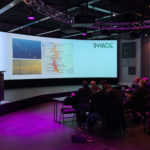 INSPIRIA Charge Court is an INVADE commercialization pilot in the city of Sarpsborg, which was presented by project manager Martin Vatne of Østfold Energi. The other INVADE commercialization pilot, Halden municipality’s climate-friendly mobility project, was presented by the municipality’s Smart City coordinator, Martin Vik. To finish up, Smart Innovation Norway’s new CEO, Thor Mosaker, shared his thoughts on the need for coordination towards stronger industrial focus in the Norwegian range of research and innovation instruments. Today, government organizations like Innovation Norway, the Research Council of Norwegian, SIVA and ENOVA offer more than 200 different research and innovation instruments. As a potential measure, Mosaker suggested creating a new program, called “Center for research-based societal and industrial development”. Its main target would be to generate new and sustainable workplaces based on the results from applied research projects. Hirdes is happy with the visit and appreciates that the committee chose to dedicate a few hours of their time to Smart Innovation Norway and their work in the EU project INVADE. “Of course, it is important that members of the Norwegian Parliament want to come here to learn, because the Standing Committee on Energy and the Environment is the leading committee for shaping the Norwegian Parliament’s energy policy. They set the framework for our research work; laws and regulations determine how the future will develop on the energy and environment front,” he comments. “In addition, we think that the Committee should play a central part in the development of new, sustainable workplaces, with an expected Norwegian energy surplus as an important instrument for innovation,” emphasizes Hirdes.